Think of a Beetle-based utility vehicle and you’ll probably conjure up images of the original Kubelwagen, or even the 1968-83 Volkswagen 181 that was never officially sold in the UK. But there was another, this time produced in Australia and bearing the rather unfortunate name of Country Buggy. Launched in July 1967, the Country Buggy was based on the same platform as the Australian-spec Beetle, employing the same engine, transmission and so on, atop which sat a utilitarian body style aimed at both the leisure and commercial markets. Marketing material of the time showed the Country Buggy equally at home in the Outback and on safari as it was hauling bales of hay around a farm, reinforcing its image as a practical utility car. The Country Buggy was perhaps at its best in fully-open form, although its canvas roof and roll-down ‘doors’ gave some protection against the elements once the weather turned. Still, who worried about minor things like comfort and dryness when you had a vehicle as rugged and as useful as this? Hopes were high that the Country Buggy would be a success, and exports got under way to New Zealand, Singapore, the Philippines and other Pacific nations. But in the end, this Australian creation was destined for a short career, with production ceasing as early as 1969 after a run of just 1956 units. Volkswagen bosses in Wolfsburg showed interest in the Country Buggy during its early days, with a couple of vehicles sent there for evaluation. But with VW Germany developing its own utility vehicle (which became the 181-series), there was never any real hope of a wider market for the Country Buggy. 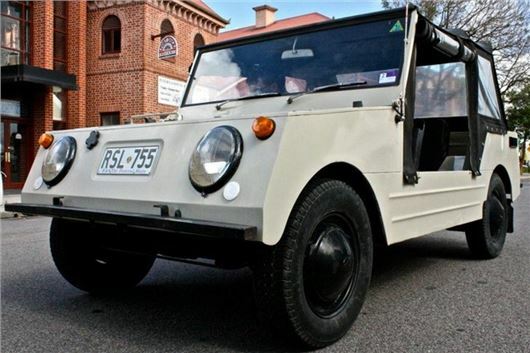 These days the Country Buggy is a rare sight in Australia, although it has its own niche following in the Philippines (where it was sold as the VW Sakbayan), with some of the survivors there having been restored by fans of the model. Who’d have thought it? Can you buy one and how much do thru cost Plse? Re- "the 1968-83 Volkswagen 181 that was never officially sold in the UK". They were actually sold briefly in the UK in 1975. A 'civilianised' version of the Type 182 (RHD VW model codes always used the even number sequential to odd number LHD code) called the Trekker. Sales were few and it was withdrawn quickly.. I think they're all on P-reg plates. A unique feature is slightly extended B-pillar for higher seat belt mounts, which I've not seen on any other countries' spec.